travel: italian adventure | eat. drink. fly. well, it is with GREAT excitement that i can say that my italy trip is officially booked and confirmed and paid up in full. well for one, we’re now BROKE, lol. but it’s all good… so worth it. but most importantly as of september 26th, we are off for almost 3 weeks to explore italy. we arrive into rome 2 days before it starts and depart when it ends… i am ridiculously pumped about this. this will trump hawaii as my longest trip ever – and also will be the furthest away from home that i’ve ever traveled. and while i’m on it… it’ll also be the most expensive trip i’ve ever taken. 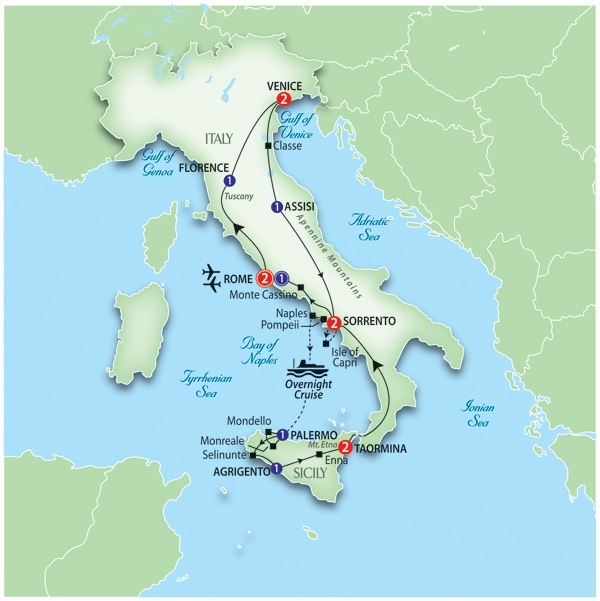 we really debated between the itinerary above that includes sicily and one that includes more of the north. but my assistant manager has traveled extensively in italy and said this one would be better because if we return to this area of the world, we’ll probably do france, germany, switzerland ect and its easy to dip down into the north of italy when you’re in the neighbourhood so to speak. in any event, we agreed. and we were both pretty keen on the idea of including sicily on this trip. i also absolutely love the idea of taking the “overnight cruise”. it includes dinner and should be pretty beautiful… i love being on the water. i hope the weather is good. we’re going to eat and wine our faces off… i’m especially excited about this in particular: Dinner with wine at a Sicilian agriturismo winery. the one thing thats really blowing my mind is the absolute value of this tour. yes, its a lot of money upfront, but now we’re done. every breakfast and 4 dinners with wine are included. so we have to budget for lunch & a dozen dinners. but our accommodations, transportation, sightseeing and everything else is done and dusted. we’ll have this trip paid off before we depart on it. and thats exciting. especially for my husband, who is much more of a money watcher than me. also, having someone else take care of our luggage and checkins to hotels ect is really going to free up our days to SEE more. we won’t be mucking around dragging bags to and fro train stations. and that was important to me. while this is a longer trip for us, it’s not a “long trip” to europe by any means. so we have to maximize our time on the ground. it’s really interesting and they break down a lot of cities with “if you only have one day – do this” kind of mentality and include walking maps. which is perfect, because in most cities, our coach will arrive, they do a spin around the city to orient you and then you do one major sight or activity and then you’re free for the afternoons. 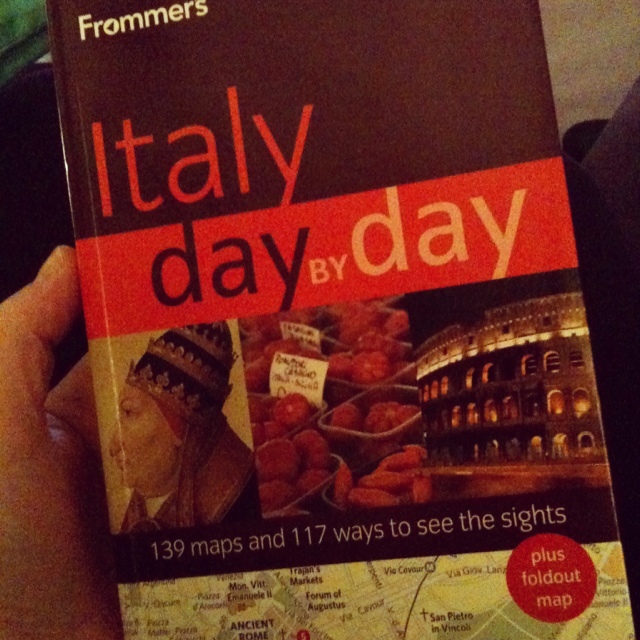 i also like that we get a local guide in Rome, Florence, Assisi, Pompeii, Palermo and Agrigento. very cool to be shown a city by a local… and i’m looking forward to seeing what they call their “hidden treasures” which is something unique to each guide that they show you that you won’t find in the lonely planet book. anyways. clearly i am very excited. i’m currently making my “to do still” list which includes: getting transfers to/from the airport in rome, booking our 2 nights hotel for before the tour starts, extending our insurance coverage to cover the length and cost of our trip and getting a book on learning italian. yey!